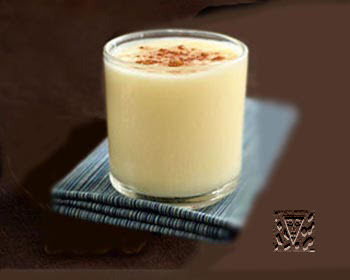 Bouza is ancient turkic drink, based on lactate fermentation of starch which is contained in a wheatflour. For preparation of bouza ancient tatars took a barley, mixed up with water, with addition of milk and talkan gave to begin to ferment in the flow of twenty-four hours. Bouza contains a no more than 4-6% alcohol and given on a dessert, being the sign of the special respect to the guests. Wash down the shredded oatmeal in cold water and steep 10-30 minutes in warm water in the closed tableware. Filter the soaked off groats, will shift on a frying pan and pound a rolling-pin. After it to dry up groats in the heated properly stove or oven. The groats treated thus are already suitable for preparation of bouza. In addition, groats after soaking off and drying in a stove possible to grind in a flour. Pour out the prepared oatmeal in capacious tableware, add a wheatflour, butter and all of it carefully mix. Pour in steep boiling water and mix to formation of doughy mass. After it densely close tableware, that it is better to save in her warm, and will hold for some time so 30 minutes. Then dilute mass the boiled water. When the leavened dough will cool down to the room temperature, add breaked up yeasts, glass of the granulated sugar and give to ferment. Prepared mass again dilute the warm boiled water, carefully mix and filter through a thin sieve. In remaining in a sieve mass add water, filter again, however impossible to assume, that bouza became too liquid. In filtered bouza add the granulated sugar yet, mix and leave for fermentation in a warm place. When bouza will become sourish taste, she is ready to the use. Keeping bouza is necessary in a cold place. On 3-3,5 l of bouza : 0,5 kg of oatmeal, 50 g of butter, 10-15 g of yeasts, 25 g of wheatflour, 250 g of the granulated sugar.